Welcome to the blog of award-winning historical fiction writer Jessica James, author of the best-selling Civil War novel Shades of Gray. This blog features touching true stories of the Civil War, Victorian romance and etiquette, and the author's musings on her travels to Civil War and historic sites. Welcome to the blog of award-winning historical fiction writer Jessica James, author of the best-selling Civil War novel Shades of Gray. This blog features reviews, interviews, personal musings and book signing dates for author Jessica James. Welcome to Book Exposure, the book marketing site of award-winning and best-selling historical fiction author Jessica James. This blog features book marketing tips and help with author press releases and book marketing plans. 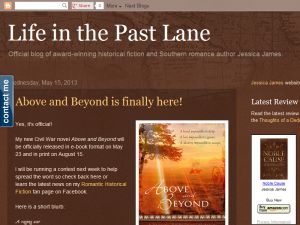 This what your Life in the Past Lane Blog Ad will look like to visitors! Of course you will want to use keywords and ad targeting to get the most out of your ad campaign! So purchase an ad space today before there all gone! If you are the owner of Life in the Past Lane, or someone who enjoys this blog why not upgrade it to a Featured Listing or Permanent Listing?